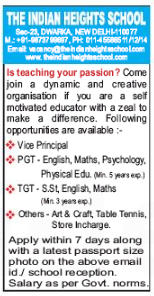 The Indian Heights School, New Delhi has advertised in THE HINDUSTAN TIMES newspaper for the recruitment of PGT plus TGT jobs vacancies. Interested and eligible job aspirants are requested to apply with in 7 days. Check out further more details below. About School: The Indian Heights School is a progressive K12 school which provides a secure and supportive environment of learning to the students. We do believe that education for life involves much more and in order to achieve this goal, students are encouraged to develop creative and logical thinking so that they can set high standards for themselves to achieve success in life.